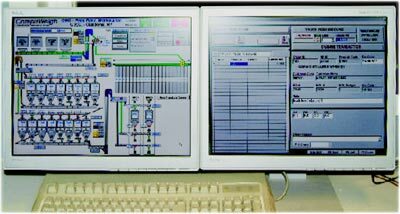 Two-screen workstation displays the total automation system for feed receiving for CRC in Caledonia, NY. Photos by Ed Zdrojewski. Commodity Resource Corp.’s unique approach to the feed and fertilizer businesses at its new Caledonia, NY facility (see page 32) requires an equally unique approach to plant automation. Part of that approach requires a high degree of flexibility and efficiency. CRC owns none of the feed, fertilizer, or ingredients that pass through the plant. Instead, customers typically deliver their products by rail, and CRC either will load out directly to truck or unload the railcars into storage and then load trucks, often using special formulas blended while the truck is at the facility. In addition, to avoid any potential cross-contamination between feed and fertilizer, the two operations are kept completely separated, though their control systems are similar in design. In order to run with just six operational personnel, CRC relies heavily on the Grain Management System® (GMS) automation package provided by CompuWeigh Corp., Woodbury, CT (203-262-9400). The GMS handles all scale transactions and inventory management and uses CompuWeigh’s automation software to control and monitor all of the plant’s physical equipment. Prior to a truck being allowed to haul product from the Caledonia plant, it must pass an in-house inspection. During this inspection, an RF tag is attached to the trailer, and the size of each compartment and the total capacity of the truck are recorded on the tag. When a truck arrives to pick up feed, it is identified at the scale by the SmartTruck RF system and checked to make sure it has passed inspection to carry feed. The operator selects the blend (or blends, if the truck has multiple compartments), and GMS ensures that the total amount loaded does not exceed the net weight allowed on the truck. While the truck is proceeding to the batching area, GMS sends the formula to the automation system, which starts the appropriate equipment and instructs the Ranco blending system on the quantity required from each ingredient storage bin. Once an order is completed, actual product usage is compared to the requested product usage, and if it’s within tolerance, bin inventory is updated automatically. The truck returns to the platform scale, where it again is scanned by the SmartTruck RF system, and the gross weight is taken. GMS makes sure that the net weight from the scale is in tolerance with the weight loaded by the batching system. 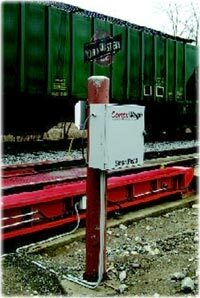 Before any railcar can be unloaded, it is read first by a CompuWeigh SmartRead RF system next to the track scale, which takes the gross weight and makes sure that the railcar is authorized to be at the CRC plant. The railcar then is taken to one of the two unload bays, where SmartRead systems again make sure that the feed and fertilizer cars are always unloaded into the appropriate receiving pits. The railcar ID automatically brings up the transaction on the receiving GMS workstation, where the operator selects the destination from a filtered list of allowable bins for that product. Once selected, the destination is transferred to the automation system, which determines the optimum path. An Allen Bradley ControlLogix PLC system validates the path and then starts the equipment to move the product to the selected destination. When the receiving operator indicates the pit is empty, a purge sequence starts up, to make sure the entire system is clear of product before automatically stopping the equipment or changing the path for the next order. With the wide variety of products handled on the feed side, the pit conveyor uses a variable-speed drive, with each product having its own default speed setting that can be finetuned from the GMS workstation. CRC provides a service whereby customers can sell a truckload of material that is stored in bulk in railcars at the facility’s railyard. The truck first is identified by the SmartTruck RF at the truck scale, where the tare weight is taken. When a truck arrives at the transload area, it again is scanned and matched with the scan of the railcar that is in position. This ensures that the correct transaction and product are selected. Screen capture shows the operating condition of feed mixing equipment at CRC. Illustration courtesy of CompuWeigh Corp.
Because there are no scales in the transload area, a CompuWatt load monitoring system is used to provide an estimate of the amount loaded into the truck. Integration with the automation system allows the operator to select a cutoff that stops the pit conveyor and allows cleanout while still loading the truck to within a few percent of its target weight. The truck returns to the scale, where the gross weight is taken, a ticket is printed, accounting updated, and the railcar, which is treated as a ‘virtual’ bin, is reduced by the net weight. CRC uses CompuWeigh’s SmartBin system, which provides realtime inventory by tracking every transaction in and out of every bin. 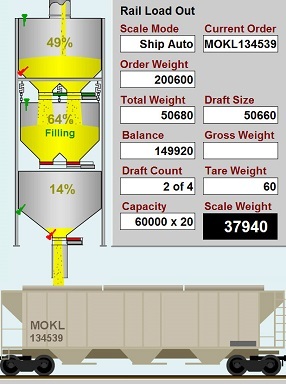 The system shows the commodity, owner, amount, and quality factors for all bins and railcars at the facility.